I have a love-hate relationship with bees. 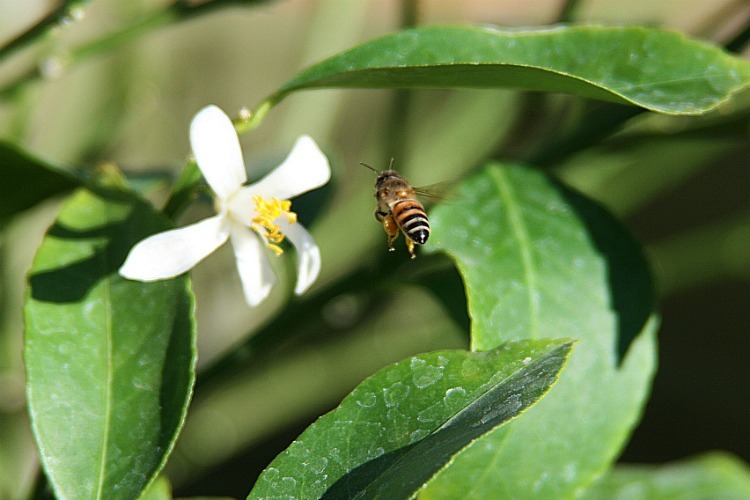 I love that they produce honey, and pollinate our fruits, vegetables and other plants. They are super-important little workers and I love them for that. I recognize the danger they are currently in and it makes me sad. I try to do my part to protect the little guys. I HATE, however, that they love me. I don't know what it is, but they are attracted to me and "bug" me. Mercilessly. On an average day, I don't wear perfume, I don't have sprays or other other smelly things in my hair, I've used a mild shampoo and conditioner that doesn't have a strong smell that lasts and even my deodorant is supposed to be unscented. But even with all of that, if I'm going to be outside I know I must also consider what colors I wear because of bees. Supposedly, they are more attracted to bright and dark colors than others. I don't know if I buy it because they seem to chase me no matter what colors I'm wearing. Now, I'll admit that to my knowledge I am not allergic to bees. I've been stung several times in my lifetime, however, and don't want to be the next adult I know who thought they weren't allergic to bees because they'd never had a problem before and then the next sting they swell up. Not to mention bee stings just hurt. And, there's a possibility at least one of my children may be allergic to bees based on her reactions to other insects, so I don't want them tagging along on our outings. Actually, if we stop the car in the middle of literal nowhere to use the bathroom on the side of the road where the nearest building was 50 miles back and the next 70 miles ahead and it's in the middle of a drought and there is no moisture around, no flowers or weeds around and no trash can full of food and drinks around AND it's nothing but dirt and dust, a bee will show up in less than two minutes. If I am outside the car. True story. And on many more than one occasion. This past fall, soccer photos were being taken in the park. The park is full of bees. Nearly every game I was bothered by bees. We drive into the parking lot and I walk around the car to help my youngest get her socks and shoes on. A bee shows up trying to get in the car. I shoo it another direction but it just gets angry and calls its friends (we do have some Africanized bees here, too, so that makes me nervous). I shut the door and run around trying get them to leave. At this point I must tell you, don't tell me to stand still and they will leave. They don't. They crawl all over me. And don't leave. My father is an entomologist and tells me all the "tricks." They don't work. Not for me. Finally I grab my daughter and run with her to a picnic table 100 feet away. I get one sock on and the bees arrive. We run 200 feet and get a shoe on. The bees arrive. We run to where people are congregating for photos, finish the dressing and the bees arrive. The bees are not bothering anyone else. Only me. I finally tell my daughters to get away from me so they don't get stung. I spend 30 minutes running from one end of a park section to another, getting only about 45 seconds of a break in between running until the bees arrive again. One bee, two bees, three bees ... Whee! One man told me to stand still and they'd leave. I knew they wouldn't, but did so to humor him. He saw they weren't leaving so he told me to stand still again and he'd take care of them. He started swatting at them but they just got worse. He told me to run. At one point I had to stop my running to help a daughter with photo paperwork. She came near me and within 20 seconds a bee had stung her. Thankfully it was barely on the tip of her finger and I was able to scrape the stinger out and she hardly felt anything. Then they wouldn't leave her alone. Her soccer photo shows a bee on her face. Thankfully she didn't get stung again. So you see what I mean? A literal love-hate relationship with these little creatures. My husband, of course, says it's just because I'm so irresistibly sweet. I'm flattered. I've noticed on the days it's warm enough to bring the lemon tree outside, the bees find it within minutes. They love lemon flowers. The last few days it just seems to be one little bee dutifully pollinating the beauties. I decided I would watch his work and try to capture him so you can see how amazing he is. I'm sure it won't be the last bee photo I show here, but I can honestly say I found beauty in Mr. Bee. Maybe if I hang around long enough, he'll let the others know I have nothing to offer but friendship if they'll just leave me alone. I am crazy afraid of bees! I have never been stung and I just run!